In previous articles, we found out the most common causes of insomnia (Insomnia and Acupuncture – Part 1) identifying several types according to Traditional Chinese Medicine (Insomnia and Acupuncture – Part 2). In this article, we will go into more practical details so that you can try different acupuncture points yourself, using acupressure, to relieve your insomnia. Kidney 6, also called Zhaohai, means Shining Sea, is a good place to bolster kidney yin and calm the mind, two interesting features to prevent and treat insomnia. This point also helps reduce nightmares as well as nocturnal epileptic seizures. Bladder 62, called Shenmai, which means the Ninth Canal, helps to quiet the mind and treat insomnia. These two points can be stimulated simultaneously allowing the whole body to rest for a good night’s sleep. The points are located at the ankle, in the depression, directly below the internal malleolus (Kidney 6) and external malleolus (Bladder 62). 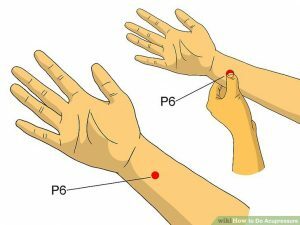 You can easily stimulate each point, doing acupressure, for a minute or two, which should be enough. Press Kidney 6 with the thumb and Bladder 62 with the index or middle finger of the same hand. You can gently massage the points with a firm pressure, without it being painful. Take deep breaths while doing one leg, then resume with the other one. Another great point to calm anxiety and insomnia is Pericardium 6, known as Neiguan, which means Inner Gate. This is a great point for dealing with emotions in general as well as stress, fears, anxiety, sadness, depression and PMS. It is often used by pregnant women because it is helpful in relieving nausea and vomiting. It is easy to stimulate. You’ll find it on the forearm, three fingers wide from the wrist fold. 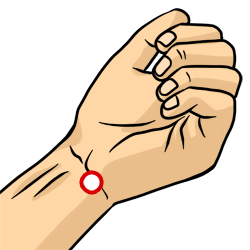 Massage the point for one or two minutes with small circular motions. Repeat with the other arm. Breathe deeply and slowly while doing it. Heart 7, known as Shenmen, means Spirit Gate. It is a must for sleep disorders. It nourishes the blood of the heart and it is a great point for calming the mind and for physical agitation. It heals fears, palpitations and stress. It can be very soothing in case of manic-depressive disorders. It is located at the ulnar end of the distal wrist crease with the palm facing upward. Press the point with the opposite thumb for about a minute, then do it on the other side. 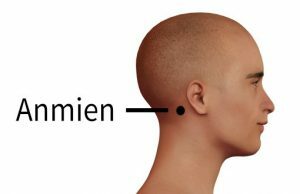 The Anmien point (also known as Anmian), or Peaceful Sleep is an extra point which is not located on a meridian. It is a master point for treating insomnia because it anchors the Shen (the mind). It is very calming and promotes good sleep. It is used for both restless and interrupted sleep as well as for nightmares and excessive dreaming. It is located in the depression, at the junction of the skull base and the mastoid process, just below the earlobe. It is possible to stimulate both Anmian points, simultaneously, using your thumbs. Apply firm but soft pressure, for a few minutes, with gentle circular motions. This point can be easily stimulated while lying on the back. So, these are a few points to help you relieve your insomnia problems without medication. These basic points do not replace a complete acupuncture treatment, but after you have performed them, you will notice the positive results. I encourage you to try them because having a restful sleep is really precious and irreplaceable. I wish you a good night’s rest! Please visit our site to find the nearest location and book an online appointment or contact our call center for an appointment with one of our health practitioners at 514 225-9520.